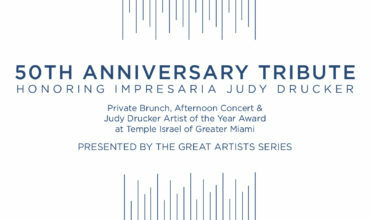 Immediate mission is to Honor the groundbreaking Legendary Impresario Judy Drucker, who brought classical music and dance to South Florida for the past five decades, with a 50th Anniversary Tribute Concert and to introduce the revival of Judy’s Great Artists Series company which she lovingly established in 1967 at Miami Beach’s Temple Beth Sholom. 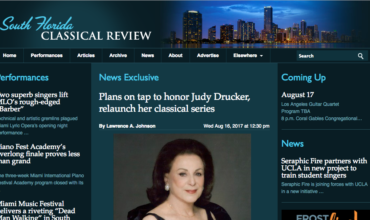 Long-term mission is to build on the groundwork that Judy started of featuring and presenting South Florida performances and events featuring and/or promoting international world-class established artists, as well as, to develop emerging young artists, musicians and dancers. 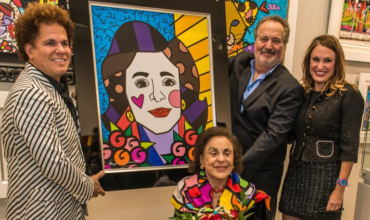 Our mission is to consistently offer cultural events at affordance prices for enjoyable and memorable experiences that will keep the audiences coming back for more. Great to see that the legacy continues. And Judy looks great!